Keep Your Content Strategy on Point With an Editorial Calendar! Insurance agents are busy people: between cold calling and meeting clients, your day is pretty much full. In all that hecticness, It may be easy to forget about posting regularly on your blog. If you want to take on content, you’ll need a way to stay organized and keep your marketing efforts on track; enter, editorial calendars. A calendar allows you to stay organized, manage content and keep track of what you already published. Plus! it can help out with inspiration! The content creation process has a bunch of steps and elements to consider in your calendar! These are some that I think you should include to be able to manage your content properly. Still, remember that these are mere suggestions and if you’d like, you can include more or steer away from some of these elements! How often will you publish new content? As seen in the image above, it’s best to do it a couple of days a week. But that depends on your skill and your ability to organize your work. Still, you should include a “date” column in your calendar so you can keep track of where you are and where you want to go with your posts. The date you start a post in is often not the same date you publish it. That’s why it’s important to establish in your calendar when you published a particular post. That way, you’ll be able to see how much time you take between posts and you’ll be on your way to gaining a constant publish flow of 2-3 times a week. Sometimes, an online marketing strategy expands beyond a blog. From social media (Facebook, LinkedIn, etc. ), to newsletters, your blog and even guest posts, you must stay on top of where you’re publishing your content. This will also help out with the kind of post you should write, the type of people who will read it and the exposure it will have. What kind of post are you working on? Is it a tips & tricks? Q&A? Real Use Case? Recommendation? Tutorial? or Other kind? Being able to visualize which type of post you did last, can help you have a wider variety in your posts! You should always include the title because you’ll be able to keep your calendar more organized. Plus, it will make it easier for you to look it up in the future. Tags allow you to organize your blog by the topics you approach in it. For example, does your post fall under health insurance, life or p&c? Again, this will help you stay on top of the content you post and will allow you to bring more diversity into your posts. How far along are you in the process with a particular post? Is is still an idea or outline? Is is a draft? Are you proofreading it? Or did you publish it already? Be sure to go back to the status as you advance on the post so you know which are done and how far you need to go to finish one. Posts aren’t always perfect when we first publish them. A comments section in your calendar will allow you to externalize any concerns you have about it. Did you miss a link? Do you want to look for images before publishing it? By writing them down, you’ll be able to come back to them and work on them until they’re worthy of the public eye! Paste the link to the post once it’s done. This way, if you need to come back to it for some reason, it will be easier for you to get there! In the subject portion of your calendar, you can put together a little paragraph explaining what the post was about. By doing it, you’ll remember what every post you did was about without having to read them again. Plus, it will help you stay focus on what topics you already did! Often times, when creating new content, the ideas start to flow. You may be doing a post on tips for life insurance and you find the need to write a follow-up post on health insurance. This happens a lot but, if you don’t have somewhere to put your ideas on paper, you may forget them soon. In this column, you can put together ideas for new posts! 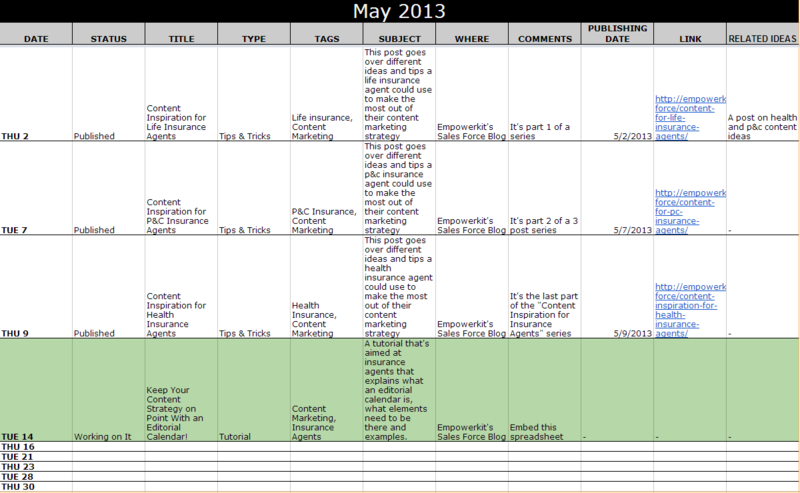 This next spreadsheet shows an example of what an editorial calendar would look like. You can use it as inspiration to create your own. I used a Google doc spreadsheet to organize this calendar but you can do it on Microsoft Excel or on one of the options the internet has to offer if you like. As I mentioned before, you don’t necessarily have to do it the same way I do. But this could help as a guide if you’re planning to get serious with content! In this example, you’ll see that this calendar only includes dates for Tuesdays and Thursdays in the month of May. I’ve mentioned before that content can be very time consuming and if you’re an insurance agent that doesn’t have much time to begin with, you’ll need to establish some days or hours to concentrate on content. The goal, as you know, is to post quality content 2-3 times a week to start gaining the leads you want and you deserve, so that’s why I’ve only included those two days for content. As you can see, that all the fields are updated as the post progresses. That’s why, to avoid any confusion, the post that’s being currently worked on, is highlighted in a green shade. Make sure to keep everything as organized and clean as possible! If you want to do content right, you’ll need to stay organized. You may think that an editorial calendar may be some extra work but, in the long run, it will help you come up with new ideas and to keep track of where you are in your online marketing strategy. Get your content on and start counting the leads coming into your site! If what you’re looking for are content ideas for Life, P&C and Health insurance agents, click on the links!